Christmas music, for the most part, tends to be both non-offensive and fairly generic- two things you can’t really say about the song, Killing in the Name by rap metal band, Rage Against the Machine, which somehow managed to become the 2009 UK Christmas #1 thanks to the efforts of a couple who was really annoyed with the coveted spot being dominated by whoever won the UK X Factor in a given year. Since 2004 (when the X Factor first aired in the UK), it has been extremely common for the winner’s debut song to become that year’s Christmas number one single thanks to a combination of timing of its release, almost ubiquitous coverage by traditional media and the popularity of the show. The X Factor didn’t really start this trend; the UK Christmas time singles’ chart tends to be dominated by reality TV contestants and has been since around 2002, when contestants from Popstars: The Rivals scored the number one spot that year. Nevertheless, the X Factor has contributed to the trend significantly, with winners of the show boasting an impressive eight Christmas number ones between them in the last decade. In 2008, in an effort to stop the show from getting the number one spot for the fourth year in a row (in 2004, the top spot went to the 20th anniversary version of Do They Know It’s Christmas), a frustrated husband and wife team comprised of Jon and Tracey Morter started a Facebook campaign to get Rick Astley’s Never Gonna Give You Up to number one as a nod to the popular internet meme of Rickrolling, where people are tricked into watching the video for the 1987 hit. While the campaign did gain some traction, managing to get the song back into the charts 21 years after its initial release, eventually peaking at number 73, it ultimately failed and the number one spot, unsurprisingly, went to that year’s X Factor winner. The success of the campaign inspired the couple to try again the following year, this time banking on the Rage Against the Machine’s 1992 hit Killing in the Name. The band’s anti-establishment mantra and the song’s theme of not doing what you’re told made it a perfect fit for what the couple were trying to accomplish. They also noted that they thought it would be “funny” to see a song like Killing in the Name reach the Christmas singles top spot. And it worked- over a million people ended up liking the Facebook page resulting in the story being widely covered by the media. The campaign was also supported by numerous well-known artists including Dave Grohl, Prodigy, Muse and even Paul McCartney, who stated, “…it’s out of left-field you know. Everyone expects Joe [McElderry] to do it, and he certainly will sell a lot of records. And if he gets to Number One, good luck to him. But it would be kind of funny if a band like Rage Against The Machine got it, because it would prove a point”. It should be noted that Paul McCartney said this several days after appearing on the X Factor. 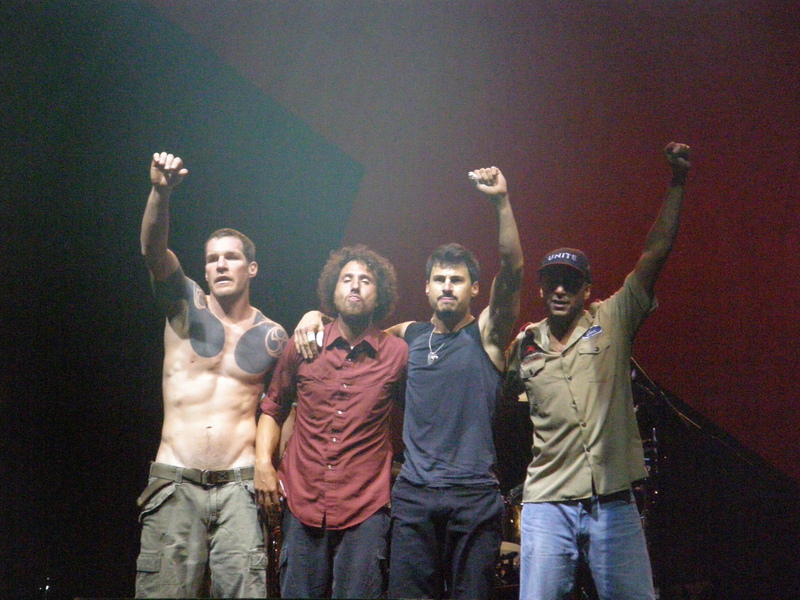 As for the band themselves, lead guitarist Tom Morello was vocally supportive of the campaign from the beginning and the band pledged to donate all the proceeds they made from the sale of the song that Christmas to a charity for the homeless called Shelter. The band also thanked fans for their support in 2010 by playing a free gig in London. This request went over about as well as you’d expect, with lead singer, Zack de la Rocha, screaming the offending line four times during the song before being pulled off air. (Later, the BBC would issue a public apology.) Morello also opened the song by loudly complaining about the X Factor and criticising the show for trying to monopolize the charts and spoonfeeding people “schmaltzy ballads”. Another delicious irony about the whole thing was that the band themselves were signed with a label owned by Sony BMI, which also owned the label X Factor winners signed with, meaning ultimately, the same massive company that was the source of the initial outrage just made more money than they normally would have thanks to the promotion and competition driving up sales. The band defended this similarly to how they’ve always defended the fact that they’re preaching an anti-establishment message while being signed with a subsidiary of one of the largest corporations in the world- they stated that it wasn’t about money, but sending a message to the widest audience possible, and, in this case, adding that they would be donating all their royalties to charity so weren’t profiting from this particular campaign. In the end, the song did make it to the number one spot with a little over half a million downloads purchased, beating out Joe McElderry’s The Climb by about 50,000 copies sold. As for McElderry, he wasn’t upset about any of it. “This time last year I never thought for one minute that I’d win The X Factor, never mind about having a debut single out, so I’m just delighted to be in the charts.” Since then, the X Factor has continued to dominate the UK Christmas single charts, winning the top spot on Christmas in 2010, 2013 and 2014.